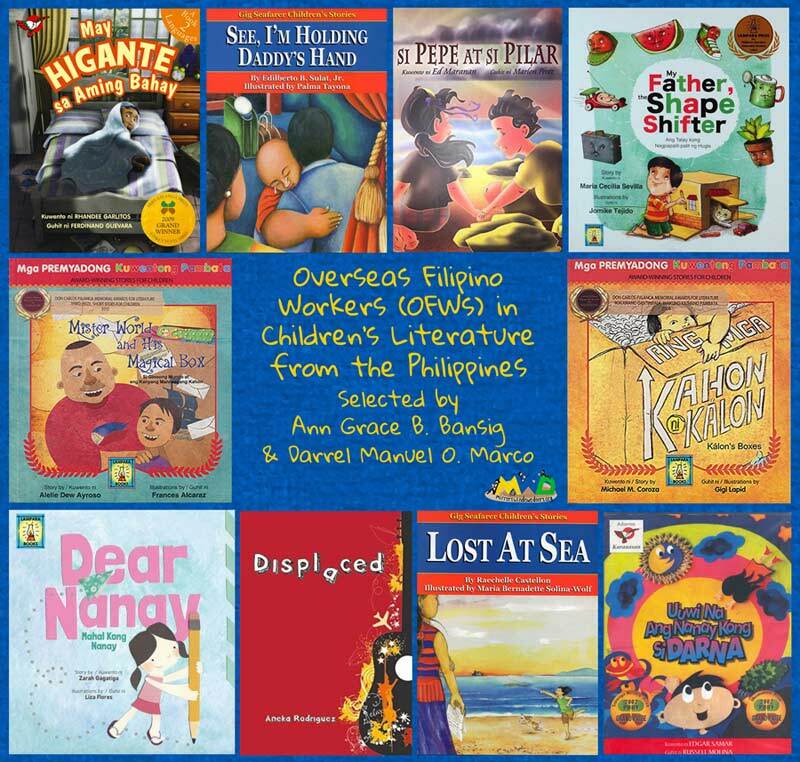 This article by Ann Grace B. Bansig and Darrel Manuel O. Marco, about how Overseas Filipino Workers (OFWs) and indeed their children are represented in children’s literature published in the Philippines, was first presented as a paper at The Fifth Asian Conference on Literature and Librarianship, held at the Osaka International Convention Center, Osaka, Japan from 2-5 April 2015. 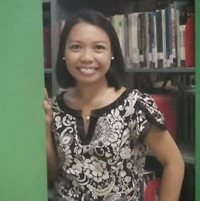 Ann Grace gained her Library and Information Science degree at the University of the Philippines Diliman, where she also completed her Masters in Reading Education. Currently, she works as the Senior High School Librarian at the De La Salle Santiago Zobel School in Muntinlupa City, Philippines. She is a Reading and Literacy advocate, content developer, travel enthusiast, storyteller and volunteer. Darrel is a Knowledge Management Specialist for Baker McKenzie in Manila, Philippines. He is also a storyteller, reading advocate and adventure-seeker. 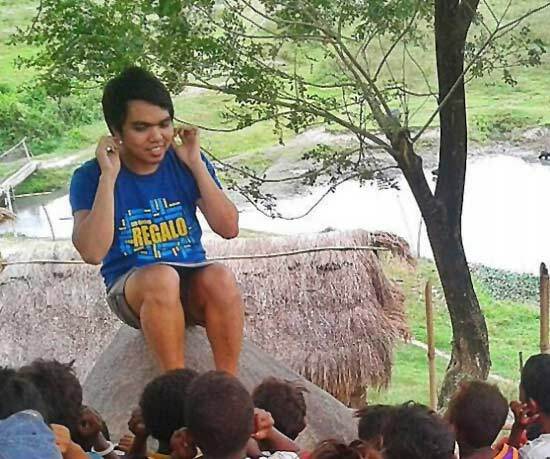 He travels around the Philippines to tell stories and spread the love for reading. He has also presented papers about libraries and children’s literature in Finland, as well as Japan. He describes himself as a lover of life, long adventures and literacy! Ann Grace can be contacted at bansigab@dlszobel.edu.ph and Darrel at darrelmarco.gmail.com. Every year millions of Filipinos opt to work abroad mainly for economic reasons. According to the Commission on Overseas Filipinos, approximately 10.5 million Filipinos worked or resided abroad in 2012. Stories about Overseas Filipino Workers (OFW) are often in the news; they are sometimes good, but most of the time bad. Many Filipinos are employed as educators, seafarers, medical professionals, production and technical staff, etc. all over the world. Additionally, many domestic workers are sought after because Filipinos are known for caregiving and patience. The rising flow of OFWs is unavoidable because Filipinos need to survive, even if this means separation from their families (Quinto, ADB, 2004). This article aims to explore how the image of OFWs is depicted in Philippine children’s literature. 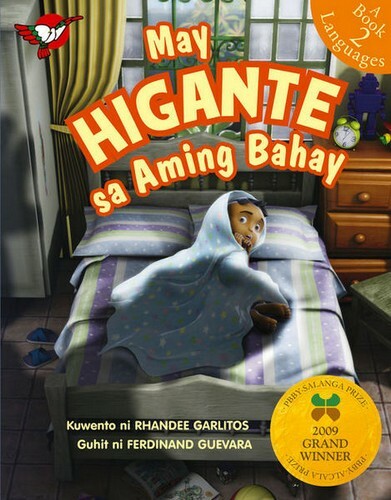 How many children’s story books contain images or stories of an OFW? Were they properly and accurately depicted and documented? The authors will examine ten children’s story books published within the last five years and analyse the plight of OFWs in Philippine children’s literature anchored on the theory that Literature mirrors life. One of the rewards of literature is the pleasure it gives the reader whether child or grown-up (Almario, 1994). People turn to literature for information, leisure reading, entertainment, or even to escape reality. Some may like what they read, while some may not. Being able to relate to literary characters is one of the great influences of literature. In general, literature will always be a part of life. Literature is also often seen as a reflection of our society. 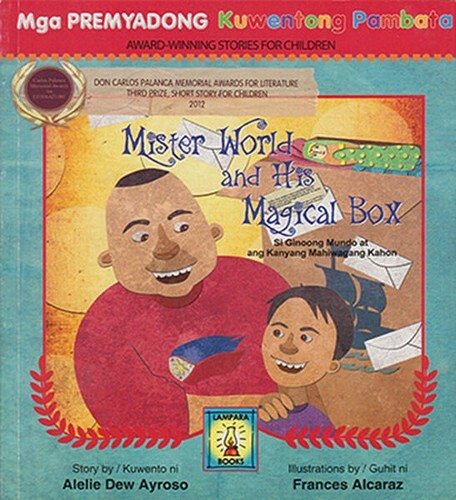 By providing “mirror books”, Filipino children’s literature creates venues for re-thinking present conceptions of childhood and family relations, which will help to understand the complexity of their present world (Gangi and Barowsky as cited in Torres-Yu, 2011). The phenomenon of migration is not a new concept in Filipino children’s literature. Globalization has been transforming family structures and family relations, bringing fundamental changes to the social and cultural worlds of Filipino children. 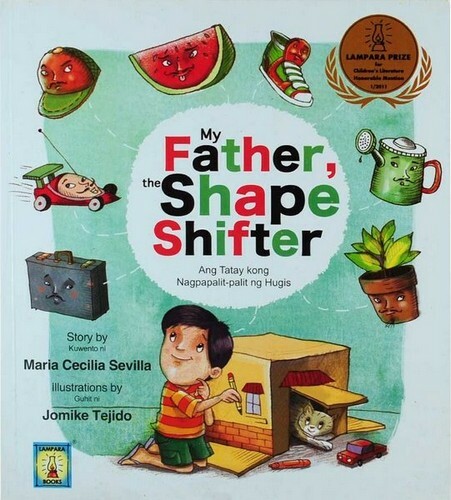 This process invariably implicates mainstream Filipino children’s literature in ways that re-affirm, as well as challenge, traditional representations of family and childhood (Torres-Yu, 2011). This article focuses on the image of Overseas Filipino Workers in Filipino children’s literature, its implications and its sociological and cultural impact. 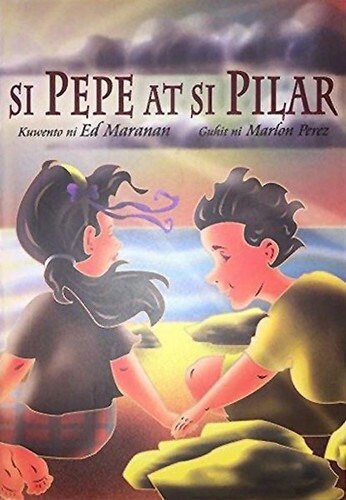 Filipino children’s literature can historicize its roots from oral tradition. Except for the known “baybayin” (i.e. the oldest writing form of the prehistoric Filipinos), most folklore tales and stories were told orally. The caton or cartilla, which instructed children how to write the Roman alphabet, was the only available children’s book during the Spanish colonization of the country. These, along with hymns and songs for the Virgin Mary, which were sung every Flores de Mayo, were the only available texts for children. The Americans, through the Thomasites, eventually brought in a lot of books to the country’s shores. These included classics such as Aesop’s fables, stories by Mark Twain and Louisa May Alcott. Most of these folktales, which were originally created for adults, were tailored to fit the reading needs of children (Alba, 2003). The more significant of these stories were the ones published by Severino Reyes who used the pen name ‘Lola Basyang’. Reyes published his first story for children in ‘Liwayway’ magazine on May 25, 1925, the first of about 400 stories retelling folktales (Alba, 2003). 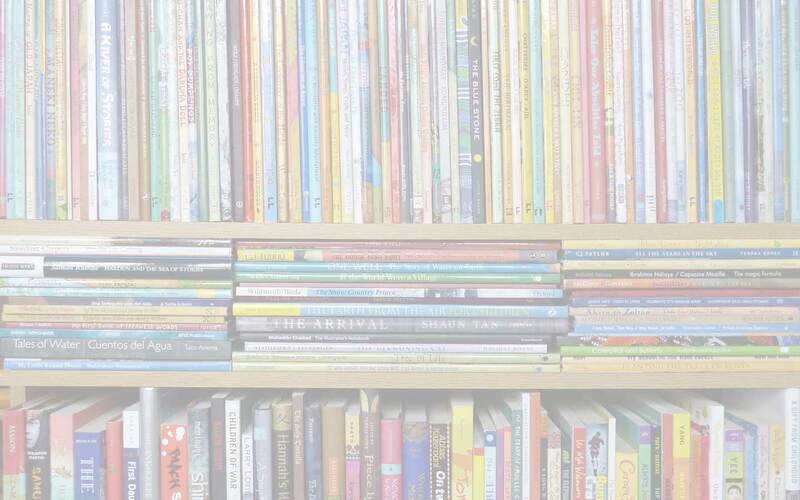 Traditionally, children’s literature includes picture books, poems, short stories, plays or novels written for children. Films, comics, books, radio, television and computer multi-media software and their popularity with children have expanded this original definition (Paterno, 1996). 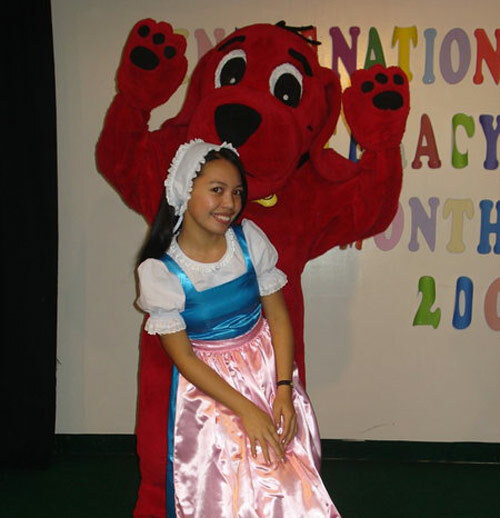 In the last decade, children’s literature in the Philippines has become a big market. 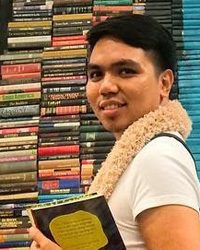 Many Filipino authors are being published now and there is now an awareness of patronizing locally produced books. Many Filipino adults today will remember how their childhood was spent with characters such as Pilandok [mouse-deer], Tiktaktok at Pikpakbom, Digong Dilaw, Ibong Adarna and Langgam at Tipaklong. 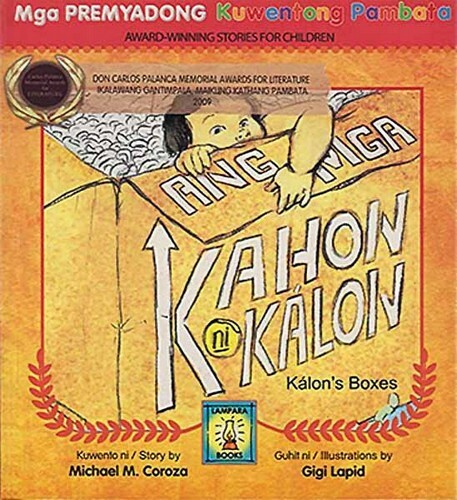 All these were possible through the concentrated efforts of local publishing houses such as Adarna House, Cacho Publishing and Bookmark, and the organizations Philippine Board on Books for Young People (PBBY), Children’s Literature Association of the Philippines (CLAPI) and the National Commission for Culture and the Arts (NCCA). The OFWs have become a major force that has been sustaining the country’s economy. No less than Senator Manuel A. Roxas in 2005 admitted that OFWs “have kept us afloat over the last few years and are thus a central leg of our economy” (Carandang, 2007). According to a study conducted by the Department for International Development (DFID) in 2007, they defined migration as an economic, social and political process that affects those who move, those who stay behind, and the places they go. And with the advent of globalization, labor migration has become a worldwide phenomenon. People are crossing borders to search for better job opportunities and to provide a better future for their families (Reyes, 2007). The Philippines is a major supplier of labor migrants to over 100 countries and the leading country from the region of Asia, along with Indonesia, for supplying female migrant workers. Based on the “Stock Estimate of Overseas Filipinos” in 2005, more than 8 million (10%) of the 85 million Filipinos were working or living in abroad. While over 72% of the total number of migrants from the Philippines were women workers. Many of these women work as domestic helpers, nurses, caregivers, and entertainers. The absent mother seems to be the emerging common form as an increasing number of women continue to join the international labor market. According to Yinger, recent assessment shows that men no longer constitute the majority of international migrants. Hence, it is estimated that about 10 million children are growing up without a mother (Carandang and Lee-Chua as cited in Torres-Yu, 2011). OFW children grieve, worry and fantasize about their parents coming home. In time, they become numb to the absence: they become like orphans. Young children cope by playing, while older ones strike up friendships and rationalize the departure of their parents. Meanwhile, OFW teenagers, particularly females, acquire the inclination to look elsewhere for parental care (Bautista, 2011). Given these scenarios, there are many heart-breaking circumstances that have resulted from the migration of a parent/s to become an OFW, such as: prone to crime, drug dependency, alcoholism and gender identity problems. Alarmingly, there have also been reports of fathers left behind sexually abusing their older female children. 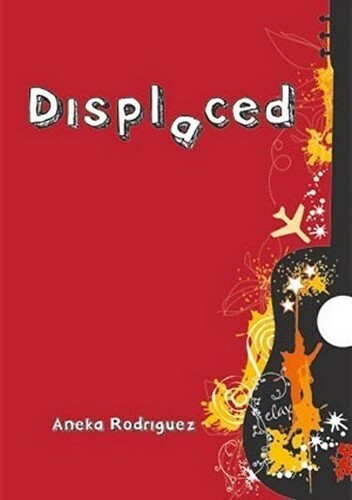 ‘Displaced’ as a title is very apt for this story whose main character is a teenager. She is already 12 when her mother leaves, but as time passes by, her memory of her nanay is fading away. As a teenager, she is at a critical stage where a mother’s physical presence is very important. This is the puberty stage where she feels awkward about herself and she is starting to have a crush at school. She is also living in a technology-rich environment and has access to most social media applications and websites, such as Yahoo messenger and FaceBook. Elay, the daughter in the story, narrates how her mother has a big dream for her so she has to work abroad to realize that for her. Her mother always sends her text messages and emails to check on her and her grandmother, to whom she has been entrusted to live with her. Her father, on the other hand, seems out of the picture as he apparently also worked abroad before but never came back. Elay’s mother’s home-coming is an awkward time for both of them because they’ve been used to communicating from afar. There are parental authority issues between them and they start to have little fights and a power struggle at home. The global parent is now at home imposing authority in person. This novel clearly depicts how family relationships have been disrupted because of the movement of Filipinos outside the Philippines. What is lacking in this novel at the end is that there is no evidence of closure or reconciliation between the mother and daughter. This is a very simple yet very heart-warming story narrated by a child who misses her mother who has to work abroad. She was made to understand the reasons why her mother has to work away. The child can’t compare all the gifts and material things that they get with their longing for the presence of their mother at home. The separation of children from their mothers is a sad reality with the OFW families. In Dear Nanay, the responsibility of child-rearing falls on the father’s shoulders. He explains to his children that they should not be sad because their mother is working hard so they can have better things in life. Nanay makes sacrifices for the betterment of their family. In the context of Filipino society, it’s the father who should work for the family. But today, more and more women / mothers work abroad. There is now a reversal of role in the family. What’s good in this story is that the children are understanding and they always keep writing to their mother to express how much they love and miss her. Many children are growing up with absentee fathers because they have to work overseas. More often, the mother who is left behind also acts as the father. This is the common scenario in OFWs’ families. The father is absent in the growing up years of their child and his presence is felt only virtually, through the advent of communications technology. In this story, technology-based communications are not used: instead, communication is via pictures and audio tapes. So the child grows up only hearing his dad’s voice. Hence, she barely knows her dad because he only comes home occasionally – until the day he finally comes home for good because he has suffered a stroke. Steady communication is important to hold the family together while one member is sacrificing for the family. Shared photos and audio tapes clearly shows strength in communication even though the words “I miss you” and “I love you” are best heard in person. OFWs’ families have to rely on different modes of communication just to keep up with the happenings and daily occurrences at home that they have missed witnessing and experiencing personally. A child growing up without a clear memory of his or her father is also a typical scenario. Coming from the perspective of a young girl here in Lost at Sea, this is very sad. But they are reunited at the end when the seaman father comes home after suffering a stroke. They have a chance to re-acquaint and bond with each other. Regarding child-rearing, the shared responsibility becomes one-sided because the other parent is away. Here, the full burden falls on the mother’s shoulders. All the troubles, problems and decision-making in the family are implemented by the mother and shared via the long distance relationship. Another important insight in this book is the part where the home-coming of the father is happily celebrated not only by the immediate family but also their relatives. Whenever an OFW is coming home, it is always a festive occasion as evident in the story. Apparently, the father also gave financial support to the extended family (relatives), as is revealed at the last part of the story. Supporting your extended family or relatives is a family custom and tradition that still holds true to this day. Within the family, those who have means and are capable of financial help always give help. This is another story of a seaman father who works away on a ship to support his family. 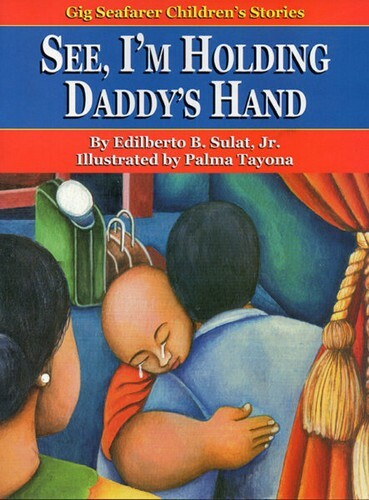 The story is narrated by the young boy who misses his dad so much. He is able to cope by imagining his father’s hand always holding him no matter what happens. The young boy understands that his father’s job as a seaman is not bad, even though he is far away from the family. In this story, the father tells his son that his working away helps keep his son and mommy’s tummies filled; all the utilities paid; that he has an allowance every time he goes to school; and even to make sure that he is at school. All these are economical in nature and this is again typical of why there is an OFW in the family. 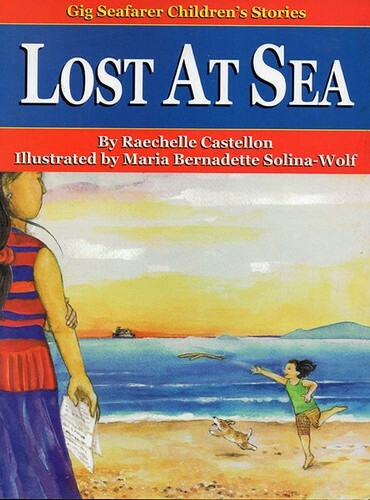 This is similar to the first seaman story, Lost at Sea (above), where the mother and son are left behind and all the responsibility is left with the mother. Again, the son is growing up with an absentee father and the father misses out on a lot of things that are happening with the son. The father’s image here is of a father who is very strong and one who loves his family so much. This story was written in rich Filipino language and depicts the life of Filipinos who live in the province. The main characters are two children who are friends and neighbors. They attend the same school and they are both honor students in class. They share with each other their life’s dreams for when they grow up. Their parents are friends and also share the work in the fields and whatever jobs they can find to make ends meet. When Pilar’s father gets ill, her mother starts doing jobs in the city three times a week until she is accepted to work abroad as a domestic helper in Canada. Pilar is so sad and does not want her mother to leave them. But someone has to work to support the family’s medicine needs and her and her siblings’ matriculation. When Pilar’s mother starts working abroad, Pilar’s grades in school dwindle. Before, she was an outstanding student, but when her mother leaves, her studies suffere. She also has to take on all her mother’s work at home. In this story, the responsibility of child-rearing and domesticity at home falls to Pilar. For a child like her, it is too much, even if she has an aunt to help out in the family. Pilar is forced to grow up into maturity because she has to assume a bigger role at home when her mother leaves. The story also clearly depicts the improvement in the life of Pilar and her family. Now, they have a television when previously only the barangay captain had one in their place. Again, these are material things that can never buy back the time of Pilar’s mother away from the family. But this is a sacrifice a mother has to make for the sake of her family. This story has a very depressing ending. Pilar’s mother dies while working overseas and her death is not resolved in the story. This is the other side of the plight of OFWs in search of greener pasture. Many of them become victims of torture, physical abuse and death, leaving their families grieving and in search for justice. In the end, Pilar tells herself that when she becomes a teacher someday, she will not leave her hometown but will stay there as a teacher. This is a story told from the point of view of a very young boy, Matt Matt, who is surprised to see a very big man inside their house one day. It turns out, that big man, whom his mother, older brother and sister have happily received and welcomed to their home, is his father, home from working abroad as an OFW. It is not explained how his mother was able to explain the absence of his father to him, while the father was away working abroad. In general, OFW fathers and/or parents have hard times and feelings when they get back home and their children are not familiar with them. Children in turn, are in need of role models, who may be the adults in their home. Sometimes, children even feel neglected and resentful towards their absent parent. Given these circumstances, most of the time, only one of the parents, or worse, neither, serves as a role model for their children. Sometimes, the grandparents or other relatives take charge of the care for the children. The large number of Filipinos overseas has made the Philippines one of the most tech-savvy countries in Asia, with a significant part of the population using different technology tools to keep in touch with family members abroad. “The findings show that technology has become an intrinsic part of our daily lives. Filipinos are big believers that technology helps us to communicate better, and it is obvious from the rate of adoption that everyone from young kids to grandparents is finding technology easier to use,” said Mae Moreno, Microsoft Philippines Windows Client product manager. In this story, despite being away from home, through the help of technology, Luis’ father becomes a cell phone, a computer or even a toy car. Despite the distance, they can still keep in touch with each other. As time goes by, it is inevitable that the boy will miss his father but with the aid of modern technology, his father is either just a call or chat away. Although the boy also sometimes feels loneliness because of the absence of his father, this is being compensated with hours of talking and chatting via cell phones and the internet. This is one of the happier stories about OFWs. One of the sad realities is that Filipinos, or Filipinas for that matter, are often typecast as Domestic Helpers (DH). It is true that there are many DH employed around the world but it is also a fact that there are also Filipinas who work abroad as engineers, doctors, nurses, teachers, etc. 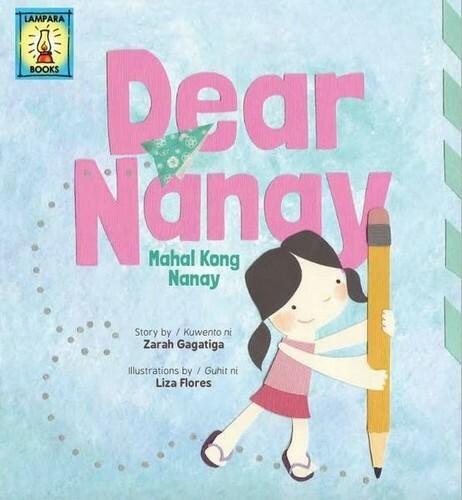 In this story, the nanay (mother) is compared to Darna, a Filipina heroine known for her courage and being kind-hearted. She is working as a DH abroad to help sustain the studies of her son and for the family to be able to have a decent life. She works for economic reasons and, although she does not have any super powers, she can make everything clean in one sweep and shiny in one swipe, and turn any grime into dimes, all the while singing her favourite songs. Throughout the story, it is emphasised how the mother works hard despite being away from the comforts of home, facing the barriers in language and culture for the sake of the family’s well-being. She always makes decisions for the benefit of her loved ones, not just her immediate family but for her other relatives as well. The story is told from the son’s point of view, and the reader can immediately see how much he misses his mother. Despite her absence, his father is always there to show him love and affection, and try to explain to him why his mother has to go away to a faraway land. Sometimes his mother sends stuff and material things to compensate for her absence, but the son always looks forward to when his mother will come home. The moment when the mother comes home is such a happy experience for the whole family, especially for the son. No material things can ever replace his mother’s place in his heart. Told from a third person’s point of view, this story highlights one of the sadder and harder points of being an OFW. Many Filipinos venture and risk going abroad, despite the odds of having abusive employers; exploitative contracts and non-regularization; accidents and calamities abroad or while on board a ship; or illnesses and disease: just to compensate for their and their families’ economic needs. This story of Kálon, who grows up in a very poor community, is one hard pill to swallow. Poverty and hunger are rampant in the cities of Metro Manila. People tend to flock there to look for stable jobs that may sustain their living. Sadly, not everyone is given the opportunity of having a good income-earning job and many settle for daily wages, which are below the necessary amount for their family’s daily needs. Many opt to try their luck and apply as blue-collar or skilled workers abroad. Out of luck and decent work, Kálon’s father was one of the few who was able to go abroad and work there. As he earns money in Dubai, he keeps sending balikbayan (homecoming) boxes, which contain different merchandise and stuff, to help his family, including Kálon. Despite the many boxes, which really do help Kálon’s family a lot, he knows that this will not compensate for the absence of his father. Until one fateful day, the box that comes home does not contain merchandise anymore, but the body of his deceased father. This story shows just how much Filipinos are willing to sacrifice their lives just to earn a decent living for their families. Sadly though, the Philippine government lacks legal assistance and repatriation efforts are very slow, especially in the Middle East-North Africa (MENA), causing many OFWs to die abroad either because of illness or abuse from employers, or as victims of war and calamities, etc. This story has a lot of similarities with Kalon’s Boxes (above). The only big difference is that the father is employed as an engineer and not as a blue collar worker. Thus, his work takes him to the different corners of the world, from where he sends his family balikbayan (homecoming) boxes containing different souvenirs and famous items from the particular places he has visited. The father is also well-equipped with different languages because of his exposure to different cultures, which he in turn, teaches to his children. He also sends them different currencies and food from the places he’s been to. The father is a hard worker and he does this to send his children to good schools. He provides for the needs of his immediate family. The family’s means of communication is through cell phones and letters. The father often sends letters with different languages in them, enveloped in his love together with his magical box. However, one day a different letter arrives at the family’s doorstep. It contains the terrible news that the father was abducted by pirates while on board a ship. Distraught, the family miss the father so much. Eventually, more letters arrive containing how great the father was. A balikbayan containing many items also arrives from the father’s many friends around the world. The absence of a father and/or a mother who works as an OFW is already a big challenge for a household. But the bigger challenge is how families of OFWs face the uncertainties and insecurities that at any time, those family members may be taken away from them through the natural course of death. It is also a big challenge to explain it, especially to children of a very young age. OFWs sacrifice a lot, including their lives, for the convenience and comforts of their families back home. 1. Working abroad equals a better life – The main reason for working abroad is to provide a better life for the family left behind. All sacrifices of working abroad compensate for the better life of the family in the Philippines. 2. Extended family support – Filipino tradition includes helping not only the immediate family but also the relatives of the OFWs. Because OFWs are perceived to have more capacity to help financially, relatives come to them to ask for help. 3. Heroism (family and nation) – OFWs are hailed as modern-day heroes because of the remittances that they send back home, which also boost the economic conditions of the country. 4.‘Balikbayan box’- This is also a very traditional Filipino customs: to send presents or gifts in the form of balikbayan boxes. OFWs always bring something home for everyone whenever they come home. This is evident in some of the books selected for this study. 5. Global parenting – OFWs are global parents because, even though they are working away from home and from the family, they still communicate with their children through the various forms of technology available to them. Even if they are away, that does not stop them from being a parent/s to their child/ren. 6. Material things cannot replace physical presence – As mentioned earlier, OFWs aim for a better life, which is why they opted to work abroad. They send money and gifts to compensate for their absence but these material things cannot replace their physical presence. Warm hugs, kisses and being around are still needed by their loved ones. 7. Domestic violence – There are OFWs who leave home to work abroad to escape domestic violence in their own home. Sadly, there are OFWs who also suffer violence at the hands of their employer. 8. Lack of government legal support – There were two stories where the OFWs died. It took a while before the bodies could be brought back home. In this case, there is a lack of government support in legal terms. Also, there are countries where a Philippine embassy does not exist. 9. Great sacrifice – OFWs stay employed abroad despite abusive employers, a lack of tenure, illness, calamities and accidents, and death because back home in the Philippines there is uncertainty for a better job. It is better to work abroad that be in the country jobless. Alabado, Ceres S. C. Multimedia Multicultural Children’s Literature in The Philippines: A Historical Perspective. Quezon City, Philippines: New Day Publishing, 2001. Almario, Virgilio S., Paterno, Ma. Elena, Sunico, Ramon C., Villanueva, Rene O. ed. 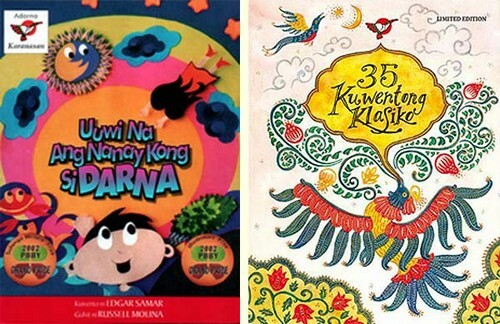 Bumasa at lumaya: A Sourcebook on Children’s Literature in The Philippines. Pasig City, Philippines: Anvil Publishing, 1994. Bautista, V. (2011). “What Happens to Children of OFWs?” Accessed March 20, 2015. http://www.transformnation.ph/what-happens-to-children-of-ofws/. Carandang, Maria Lourdes Arellano-. Nawala ang Ilaw ng Tahanan: Case Studies of Families Left Behind by OFW Mothers. Manila: Anvil Publishing, 2007. Reyes, M. “Migration and Filipino Children Left-Behind: A Literature Review.” Miriam College – Women and Gender Institute (WAGI) for the United Nations Children’s Fund (UNICEF), 2008. Accessed October 1, 2017. https://www.unicef.org/philippines/8891_10202.html. Torres-Yu, R. (2011). “Childhood and Family in Contemporary Children’s Fiction: Resilience, Agency, and Emergence of New Gender Norms.” Kritika Kultura, Ateneo de Manila University, 2011. Accessed October 1, 2017. http://journals.ateneo.edu/ojs/index.php/kk/article/view/1432. The photos acc in this article were kindly provided by and are ©Ann Grace B. Bansig and Darrel Manuel O. Marco. 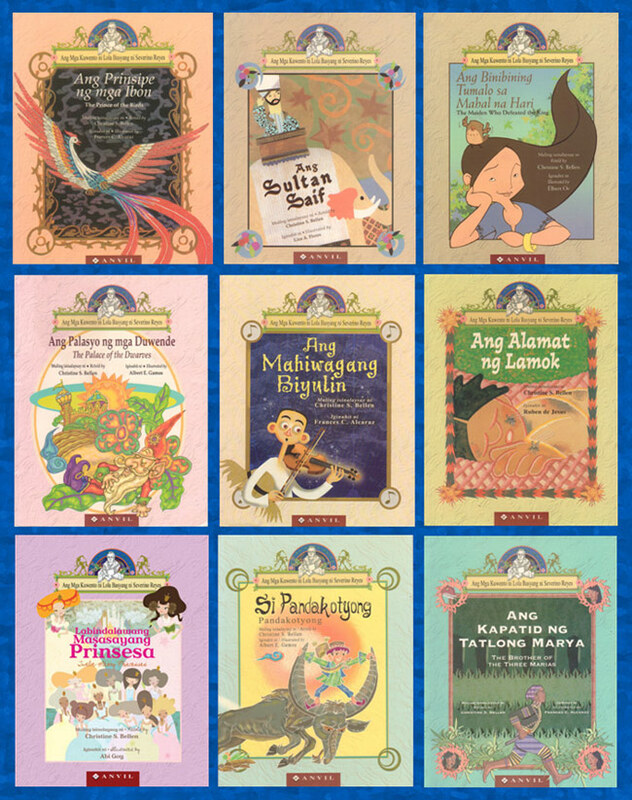 35 Kuwentong Klasiko [35 Classic Tales], Adarna House, Alelie Drew Ayroso, Aneka Rodriguez, Ang mga Kuwento ni Lola Basyang ni Severino Reyes [The Stories of Grandmother Basyang by Severino Reyes], Ann Grace B. Bansig, C & E Publishing (Philippines), Cach Publishing (Philippines), Children's Literature Association of the Philippines (CLAPI), Darrel Manuel O. Marco, Dear Nanay, Digong Dilaw, Displaced, Ed Maranan, Edgar Samar, Edilberto B. Sulat Jr., Ferdinand Guevarra III, Frances Alcaraz, Gig and the Amazing Sampaguita Foundation (GASFI), Gig Seafarer Children's Stories series, Gigi Lapid, Ibong Adarna, Jomike Tejido, Katrina Guttierrez, Lampara Books (Philippines), Langgam at Tipaklong, Liza Flores, Lost at Sea, Maria Bernadette Solina-Wolf, Maria Cecilia Sevilla, Marlon Perez, May Higante sa Aming Bahay [There's a giant in our house], Mga Kahon ni Kálon/Kálon's Boxes, Michael Coroza, Mister World and his Magical Box/Si Ginoong Mundo at ang Kanyang Mahiwagang Kahon, Mitzi Villavecer, My Father, National Commission for Culture and the Arts (NCCA) - Philippines, Overseas Filipino Workers (OFWs), Palma Tayona, Philippine Board on Books for Young People (PBBY), Pilandok, Raechelle Castellon, Rhandee Garlitos, Russell Molina, See I'm Holding Daddy's Hand, Severino Reyes, Si Pepe at si Pilar, the Shape Shifter/Ang Tatay kong Nagpapalit-palit ng Hugis, Tiktaktok at Pikpakbom, Uuwi na ang Nanay Kong si Darna [My Mother who is Darna will Now Come Home], Zarah Gagatiga. Bookmark. This is a great article. Thank you, Marjorie, for featuring this!